If you are into collecting signed card sets you almost have to have this lot! 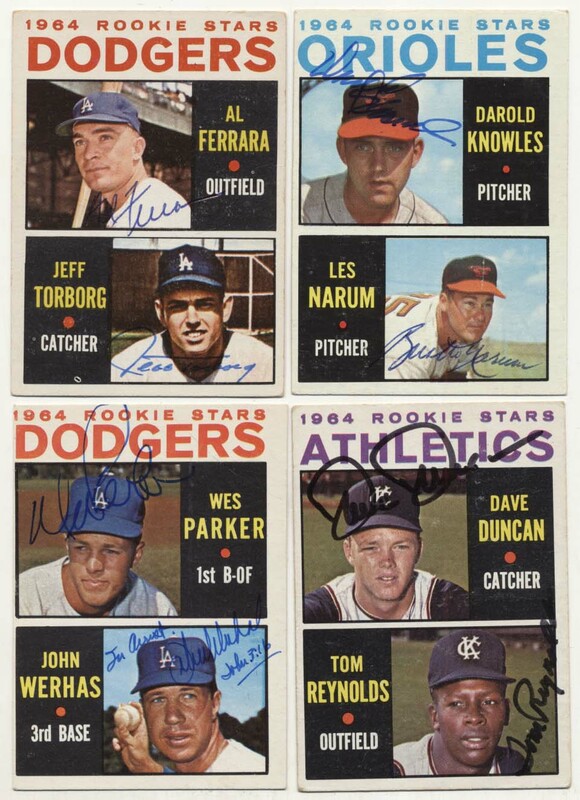 All are multi-signed cards, fully signed unless noted! Condition is very clean overall, signatures are in both ballpoint ink and sharpie. A unique offering, content is as follows: 64T: 14, 74, 94, 107, 192, 337, 378, 388, 418, 456, 428, 459, 479, 482, 488, 502, 516, 524, 528, 536, 548, 564, 572, 576; 65T: 82, 107, 194, 331, 354, 368, 409, 41, 421, 449, 466, 493, 497, 501, 517, 521, 541, 546, 566 (2), 573 (2), 581 (no Perez), 589, 593; 66T: 11, 27, 44, 107, 234, 264, 311, 333, 373, 442, 482, 529, 544, 549; 67T: 12, 123, 167, 253, 272, 341, 367, 384, 459, 507; 68T: 113, 142, 162, 228, 301, 314, 328, 348, 409 and 69T: 66, 114, 136, 224, 266, 358, 404, 439, 454, 468, 476, 519, 534, 611 (2), 628, 637 (2), 641 (2), 654 (2), 658, 662. JSA LOA.